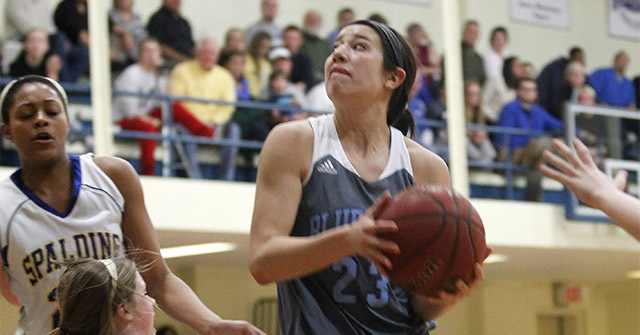 The Westminster women’s basketball team opened the 2014-15 season with a 75-70 victory over Millikin University at the CCIW/SLIAC Challenge on November 15. The Westminster Blue Jays opened play with a 14-4 run. Millikin hit a three-pointer coming out of a 30 second timeout to put the game at 14-7, but the Blue Jays struck an 11-2 run to grab an 18 point lead with 9:32 remaining in the first half. A three-pointer by sophomore Bailey Mitchell gave the Blue Jays a 21 point lead, 39-18. Millikin put in two layups and went 8-8 from the foul line to cut the Blue Jay’s lead to just nine points with 1:43 left in the half. Millikin added one more three before halftime, sending the game into half with the Blue Jays leading 39-33. Millikin came out in the second half and scored eight unanswered points, taking their first lead of the game. Two buckets by junior Mackenzie Haddox tied the game up, but Millikin took back the lead with a layup. The lead bounced back-and-forth for the next three minutes, but sophomore Andrea Zalis dished in a pass to sophomore Krista Armontrout who finished with a layup to put the Blue Jays up 51-50. Haddox, junior Sadie Theroff and Zalis each went 2-2 from the foul line, and Gatson put up a layup to take an 11 point lead, 70-59. Millikin then struck an 11-2 run in the next minute and a half to bring the game within two with 45 seconds remaining in the game. In the final 12 seconds of the game junior Tylere Goans went 3-4 from the foul line to secure the 75-70 win. “It was a good win out of the gate for us,” commented Coach Braden. Zalis led the Blue Jay offense with 17 points. Haddox added 14 points to the win, pulled down 7 rebounds and put in four assists. The Blue Jays close out the CCIW/SLIAC Challenge tomorrow at 1:00 p.m. with a game versus Elmhurst College.